Hello from Paris. 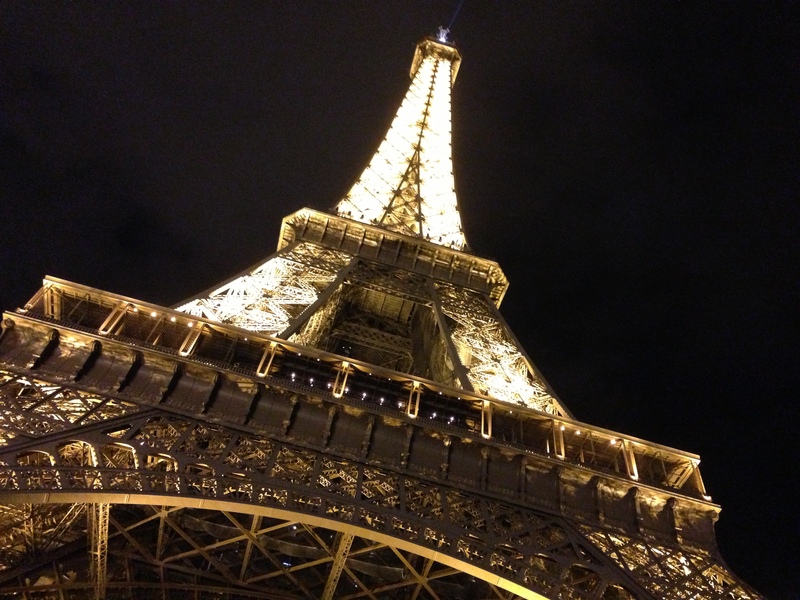 No, not Paris, Texas…the real deal, Paris, France, where food rules. Remember a couple of weeks ago when I blogged about Caramelized Onions, Pasta, and Parmesian and how I haven’t been eating any white foods (bread, rice, pasta etc.)? Well, you can scratch that from the records. After six days in the City of Light, or what I think should be renamed the City of Baguette AKA white bread, I am recommitted to the white food cause. And, I’m pretty sure I found those seven pounds I recently lost too. C’est la vie. Did I mention I hadn’t been eating much cheese lately either? Well, that little commitment to my cholesterol has gone down the drain as well. 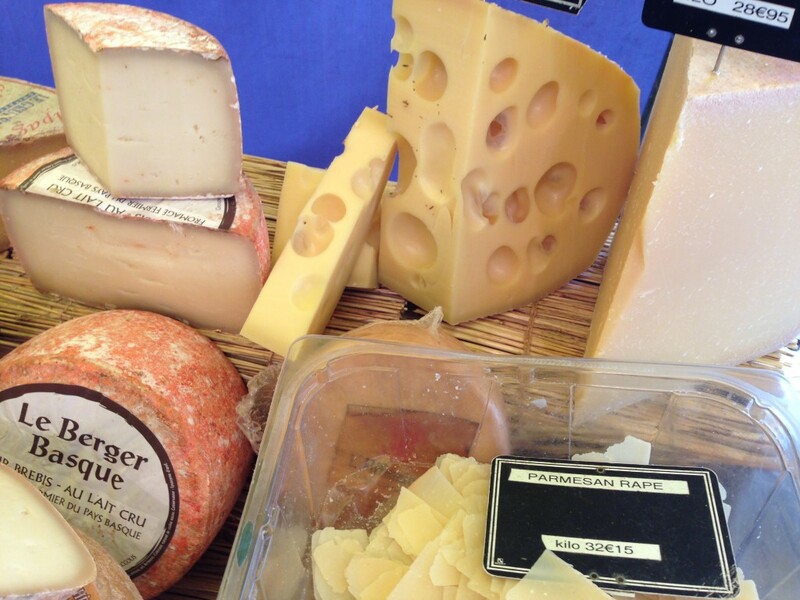 How could I resist all of this fabulous French cheese? 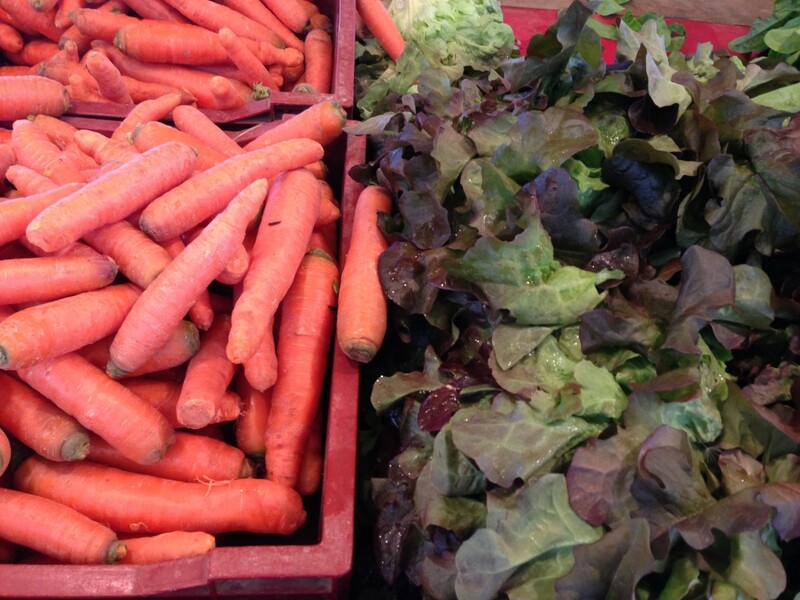 But, not everything at the outdoor markets is unhealthy. 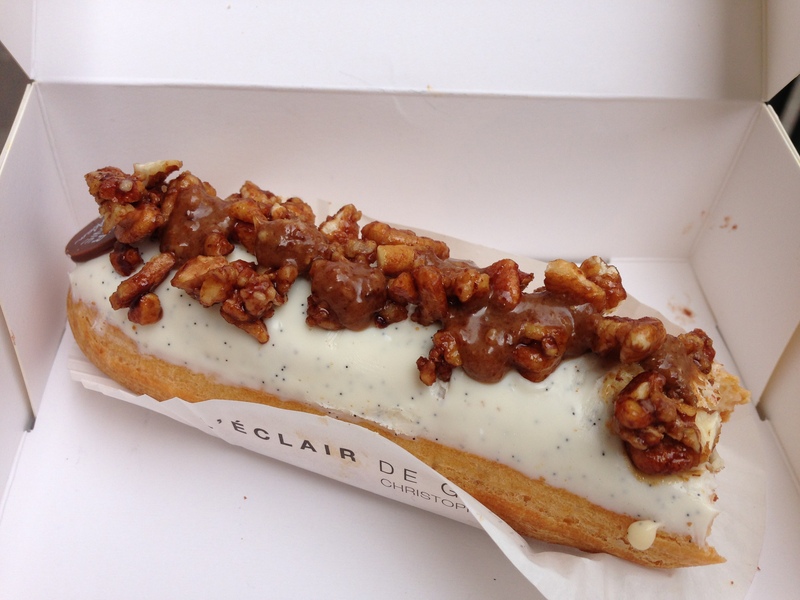 This is a city where you can grab a delicious sandwich, a crepe, or a pastry and sit on a park bench to simply watch the people, and enjoy your food of choice…a tuna sandwich on a baguette, a quiche, a pizza of goat cheese, spinach, and olives, or maybe a tiny eclair from the new Marais hotspot L’Eclair de Genie at 14 Rue Pavee’. If you’re looking for something a little more comfortable and a lot more swanky than a park bench, head to the Bastille neighborhood and enjoy a topnotch seafood extravaganza at Brasserie Bofinger (5 Rue de la Bastille). This place serves up seafood platters of lobster, crab, and shrimp complete with an assortment of vegetables piled high in the middle. We went to Brasserie Bofinger on Saturday night – a very busy night. And, I admit, my French is minimal. I mean minimal – like hello, thank you, and please. So, I need a menu in English unless I want to put every word I don’t know into my phone’s translation application, which is obviously very tedious and obnoxious. And, on this particular night, at Brasserie Bofinger, there was no cell phone service inside the restaurant’s thick walls, so I was out of luck. We were trying to figure out what to order and wanted to try a seafood platter since that is what they’re known for, but each platter had something called tourteau listed as one of the seafood choices. To me, this sounded like tortoise, and I was panicked this might actually be tortoise (turtle is aquatic after all). I said to my partner, “If they bring us a big platter of turtles, I’m not eating them.” In my mind, I pictured turtle meat served in little shells. Turns out tourteau is crab. Eventually, we did get a menu in English and ended up sharing two seafood dishes skipping the platter all together. One of our choices was the gratin of blue lobster in lemon butter with a tiny crock of vegetables. 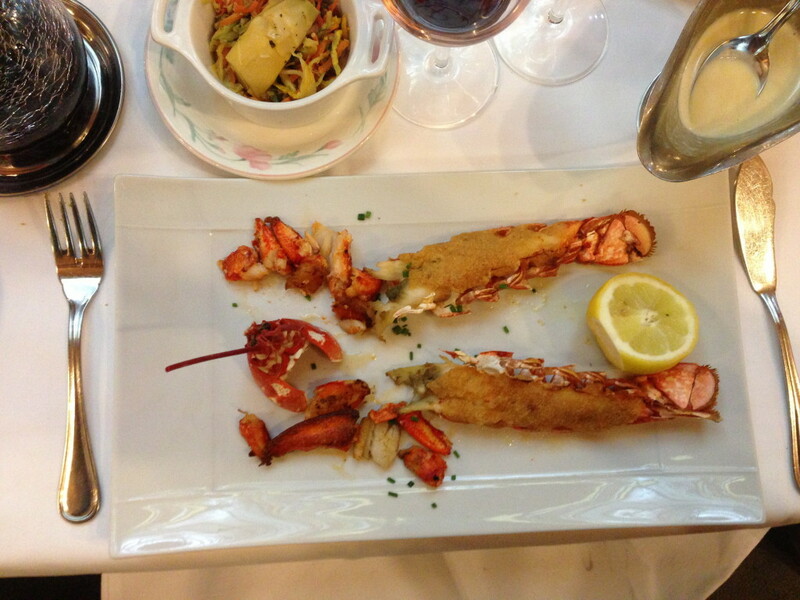 The lobster was a split tail lightly fried and delicately delicious. 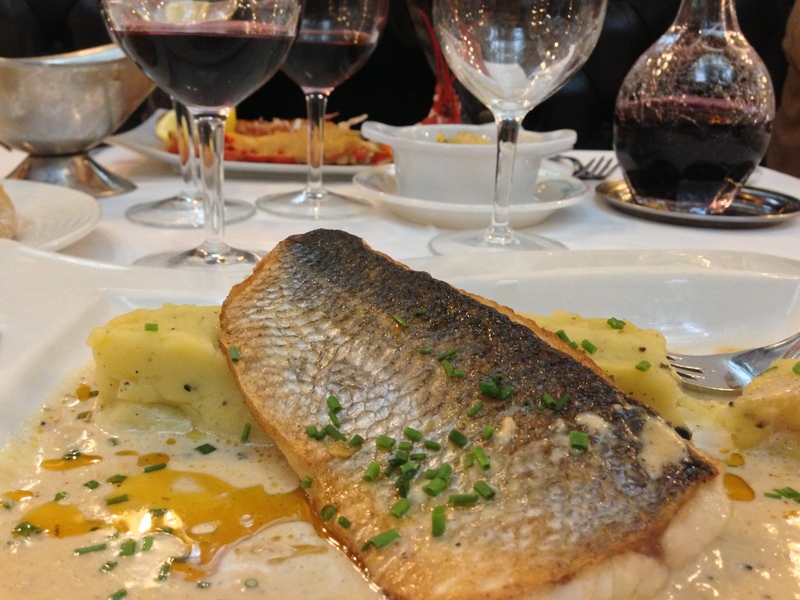 Our other choice was the grilled filet of sea bass served on top of black truffle mashed potatoes. I liked the lobster best, but the sea bass spoke for itself with its mild flavor, and you can’t go wrong with black truffle mashed potatoes. Before I put you to sleep with all of this chatter about baguettes, eclairs, markets, and turtles, I have to tell you that Paris is full of Italian restaurants. Remember I’m Italian, I don’t eat meat, and French restaurant menu’s are full of meaty dishes, so Italian is right up my alley. We found a gem in the Marais called Soprano (5 Rue Caron). 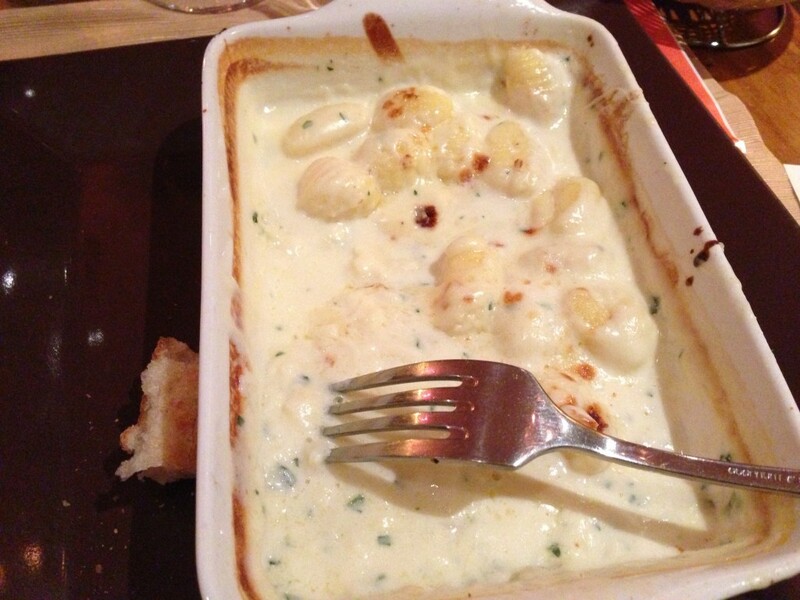 And, you’ll never guess what I had – yep, gnocchi. It was served in a heavenly blend of four cheeses in a small casserole. Despite the rich sauce, it was the lightest gnocchi I’ve ever eaten. Paris is an amazing city and a true adventure in food. Whether you take a picnic to one of their many sculpted and statued parks, sit at a cafe for a leisurely lunch, or find a tiny bistro tucked in a romantic corner for a lingering three hour dinner, every day is a feast for the imagination, the senses, and especially the taste buds. 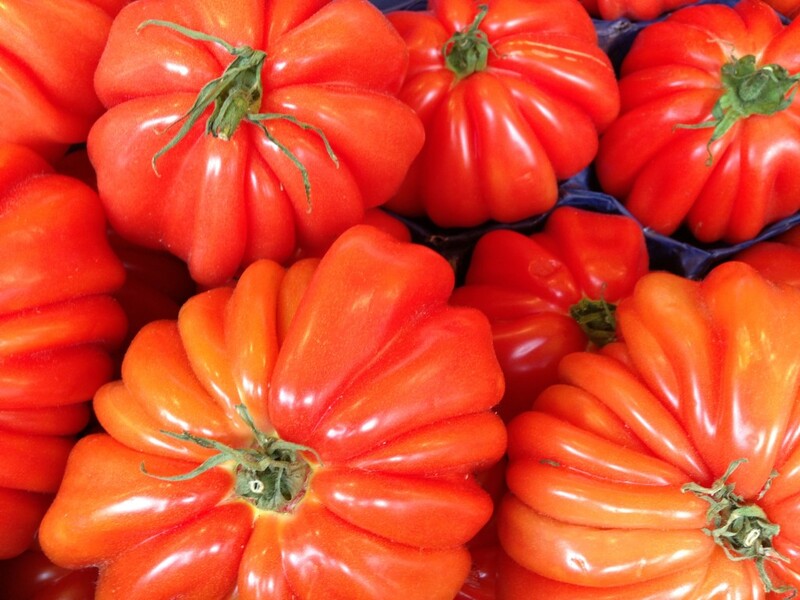 Bon Appetit from the City of Light! 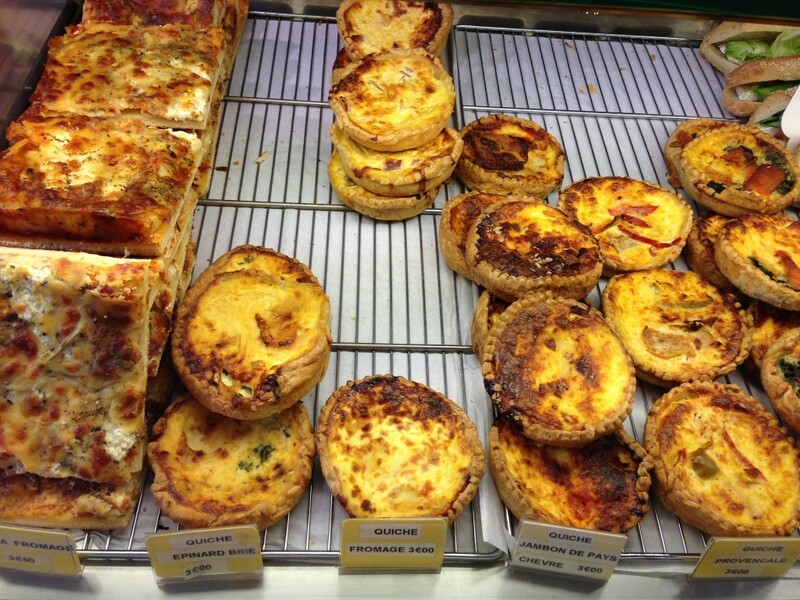 This entry was posted in Bread, Dessert, Eating Out, Exploring, Fish, Main Dishes, Quiche, Sandwiches & Wraps, Seafood, Uncategorized and tagged Baguette, Brasserie, Cafe, Cheese, Eating Out, Eclairs, France, Italian, Lobster, Markets, Paris, Pasta, Pastires, Quiche, Restaurants, Seafood. Bookmark the permalink. 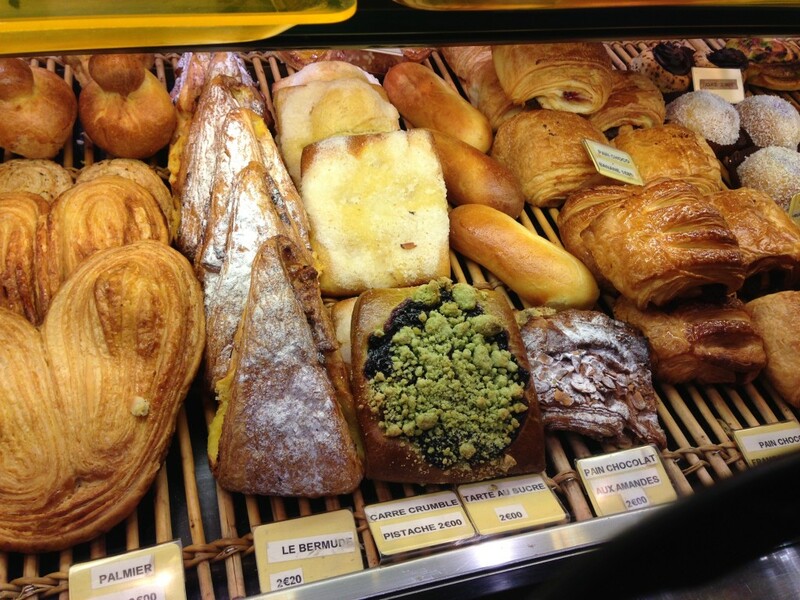 I loved the pictures of the wonderful dishes and pastry that abounds in Paris. I wish I could reach through the ipad and enjoy all of it with you both. Enjoy! We wish you were here with us too Faye. All of the food here is so beautiful and wonderful.